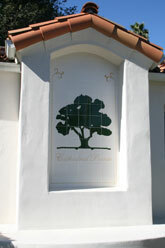 Cathedral Pointe is an award winning 48 unit planned development located in Santa Barbara County. This unique infill project received design recognition for innovative site design, floor plan concepts and project theming. The project concept involved working with hundreds of existing mature Coast Oak trees. The end result is a new community of high middle market homes with the theme and appearance of a 40 year old development. This project was an impressive marketing success and sold out quickly. There are four single family plan types, ranging from 2100 to 2700 sq.ft. with three exterior elevations each. The project includes a decorative perimeter wall, extensive common area landscaping, central park, pool and cabana.